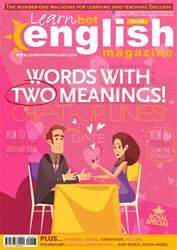 Digital Subscriptions > Learn Hot English > 203 > CHAT-UP LINES WITH DOUBLE MEANINGS! Now test your knowledge of words with more than one meaning with these chat-up lines. A “chat-up line” is a sentence or phrase you can use with someone who you like (in the romantic sense!). Read or listen to these chat-up lines and see if you can explain the double meanings of the words or expressions in bold. See page 47 for the double meaning of the words in bold.